Earning a Master of Business Administration from a top-ranked program opens doors to tremendous career opportunities. MBA@UNC blends top-20 ranked UNC Kenan-Flagler’s world-class curriculum, faculty and resources with the flexibility of online learning. Students network face-to-face with accomplished leaders, develop the insights to lead top organizations and earn the same degree as on-campus students. ● Earn an elite MBA degree from anywhere in the world with no need to relocate. ● Develop the strategic insights to lead top organizations. ● Learn from expert faculty in live, face-to-face online classes. ● Participate in three-day, in-person immersions in cities all over the world. 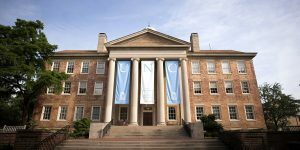 MBA@UNC requires students to complete 66 credit hours. Students generally take two classes per quarter, in order to complete the program in 24 months. However, to allow for maximum flexibility, students can take classes full or part-time to earn a degree in as little as 18 or as many as 36 months, depending on their chosen course sequence. Curriculum consists of core courses designed to build foundational business knowledge, as well as a number of elective courses that allow students to tailor their education to their own unique career goals. MBA@UNC students also have the opportunity to take credit-bearing elective coursework from other online graduate programs delivered by several top-tier colleges and universities. The MBA@UNC Career & Leadership team offers post-MBA employment support to MBA@UNC students and alumni. The Career & Leadership team works with students on an individual basis to understand their career goals—whether those goals are to rise internally within their company or to make a larger transition—and work out a customized strategy for them. The Virtual Company Information Session replaces typical “on-campus recruiting,” enabling executives across industries to explain their companies’ cultures and hiring needs to current students. Following each session, the Career & Leadership team gathers the résumés of interested students and passes them onto the company’s recruiting team. Career support continues after graduation, as alumni can access their services as well as take additional MBA courses at any point. Since the inception of the program in 2011, 76 percent of students were promoted or changed jobs while enrolled. After graduation, students have seen a nearly 30 percent increase in salary on average. Leading employers include Amazon, Bank of America, Google, Lockheed Martin, and other Fortune 500 firms. For the current academic year, MBA@UNC tuition costs $1,884.02 per credit hour, which brings tuition for the full 66-credit program to $124,345. Tuition covers student fees, simulations, assessments, technology use, global immersions, and some academic materials. It does not include textbooks or travel for immersions. With regard to financial aid, MBA@UNC has partial tuition fellowships based on merit. The program also offers financial benefits for veterans. Additionally, students can secure federal and private loans to cover the cost of attendance. You must have a bachelor’s degree. We evaluate your ability to perform from your academic transcripts and Graduate Management Admission Test (GMAT) scores. MBA@UNC’s testing requirement is based on the applicant’s number of years of professional full-time work experience. MBA@UNC applicants must have a minimum of two years of professional work experience. While we value advanced degrees as part of an application, they are not a substitute for work experience. ● A GMAT External link or GRE External link score report is not required. ● Applicants may opt to submit a current test score as part of the application if they so choose. ● The Admissions Committee reserves the right to request a score report as additional information to more thoroughly assess an applicant’s quantitative and analytical readiness for the academic rigor of the program. ● A GMAT External link or GRE External link score report is required. ● A waiver may be considered for a candidate whose academic records and professional work experience demonstrate a high level of quantitative and analytical skill and ability necessary for academic success in the MBA@UNC program.